Looking to add stickers to your Artist Shop? We've got you covered with this handy sticker creation guide! Artist Shop stickers are Kiss Cut, meaning the stickers are cut to shape but the backing of the stickers will remain rectangular. This is as opposed to Die Cut, where the sticker backing is cut into the shape of the sticker and the artwork. All stickers have a border added to the artwork when cut. This border will increase exponentially based on the size of the sticker. So, for a 2x2" sticker, the border is expanded by approximately 20px to create the cut line. For a 3x3" sticker, there is a 30px increase, for 4x4" it's 40px and for 6x6" its 50px. This means that the stickers will be Kiss Cut on the outside of your design only- as you can see with the pink cut line, but not cut inside regardless of the design. 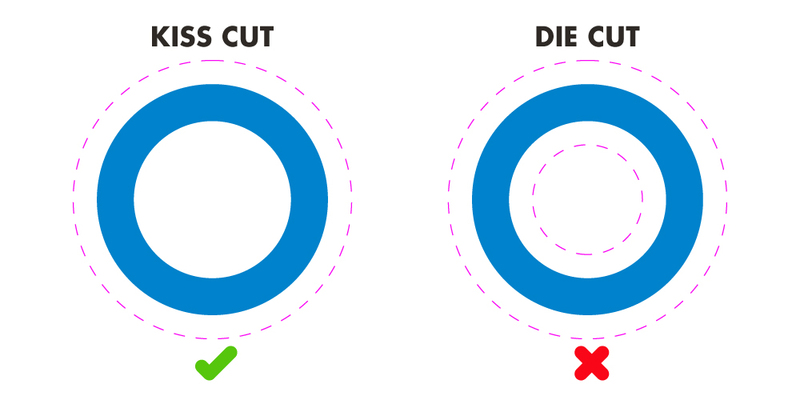 In the example below, the pink cut line is only on the outside of the circle and the inside would be white or transparent depending on the sticker selection you choose. Stickers work best when the artwork is opaque. Designs that have transparent areas or images that aren't solid will not be ideal for stickers. For example, the image below has pixels of teal that are more than 50% transparent. This color is not solid and therefore will not be defined or cut. You can see the dotted line cut is only around the sold areas and not the teal parts of the image. Any pixels below 50% opacity will not register and may be cropped from the final cut sticker. 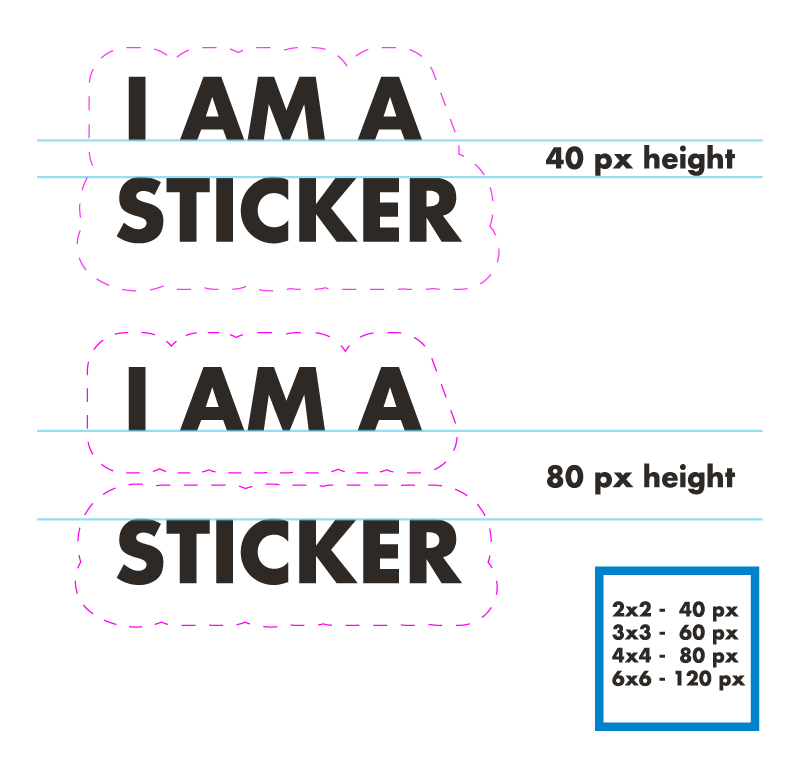 Depending on the spacing of your design elements, the blank or transparent distance may cause a single design to be separated into two stickers. This distance is measured in pixels and will scale with the size of the sticker. The 2" sticker is 40 pixels, 3" sticker is 60 pixels, 4" sticker is 80 pixels, and 6" sticker is 120 pixels before they will be cut. Below are two examples of a 2" sticker with a pink cut line around the text. 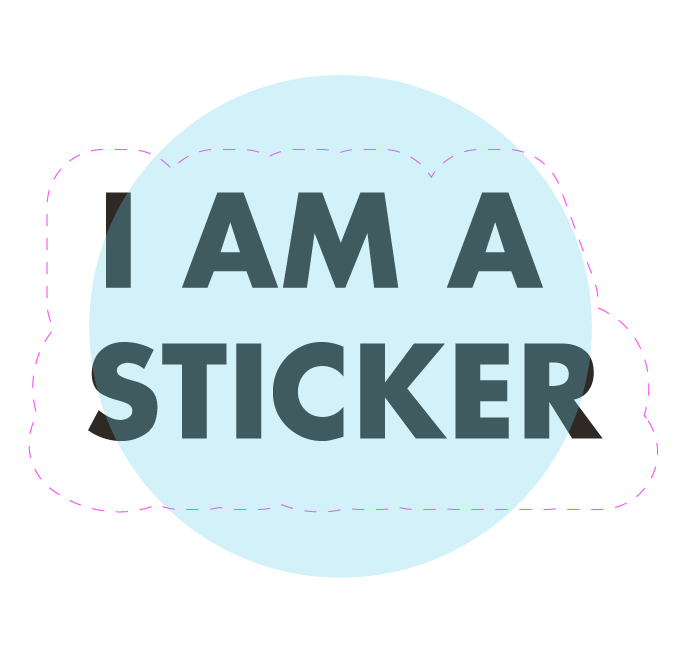 Example 1 (top): Design is all within 20 - 40px of each other and will be cut into a single sticker. Example 2 (bottom): Design with a transparent distance greater than 40px and will result in two separate cuts and two stickers.